We hear the same question over and over as the monarch migration season begins: what will be the best days for seeing monarchs in Cape May? Unfortunately we have no crystal ball and we cannot know exactly which days will bring peak flights. We can tell you that most migrating monarchs historically pass through our region between about Sept. 15 and Oct. 20, but during that 5-week period each year there are days with many monarchs and days with few. A big factor is the weather. Just like the southbound songbirds, raptors, and dragonflies, most monarchs seem to show up in Cape May after an autumn cold front brings northwest winds into the region. But like many elements of nature, the monarch migration peak simply cannot be predicted. 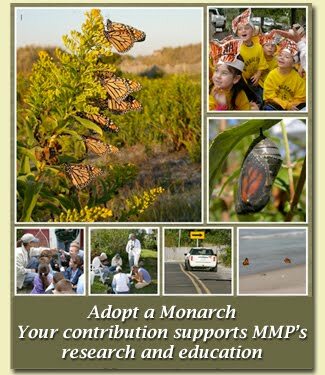 So what should you do if you want to come to Cape May and see monarchs? Come whenever you can, and stay as long as you can. During September and October there are always some monarchs around. Plus the weather is generally great, the summer crowds are gone, and along with monarchs there are other butterflies, dragonflies, and migratory birds to be seen. And if you can get to Cape May quickly, watch this blog regularly. We promise to update quickly when we see the numbers of monarchs increasing. where they will spend the winter in clusters with many thousands of other monarchs.